1. Pre-heat oven to 180°C/350°F and line a cupcake baking tray with cupcake cases. 2. Cream the butter and sugar together until light and fluffy. Add the egg a little bit at a time and beat until well combined. 3. Add the buttermilk, white wine vinegar and vanilla extract to the mixture and whisk until you have a light batter. 4.Mix together the cocoa powder, baking soda and plain flour in a separate bowl and mix until combined. 5. Fold in the dry ingredients to the wet ingredients until you have a smooth mixture. Add the gel food colouring until you get the required red colour. 6. Pour the mixture into the cupcake cases and bake in the oven for 12-15 minutes until a cake skewer comes out clean. Once baked, remove the cakes from the oven and place on a wire rack to cool completely. 7. To make the frosting beat together the cream cheese, butter and vanilla extract until smooth. Add the icing sugar and beat until the frosting is light and fluffy. 8. Place the frosting in a piping bag with a wide star nozzle and pipe a generous swirl on top of each cake once they are cool. 9. To make the red ‘blood’ combine the remaining icing sugar, water and food colouring until you get a red paste. 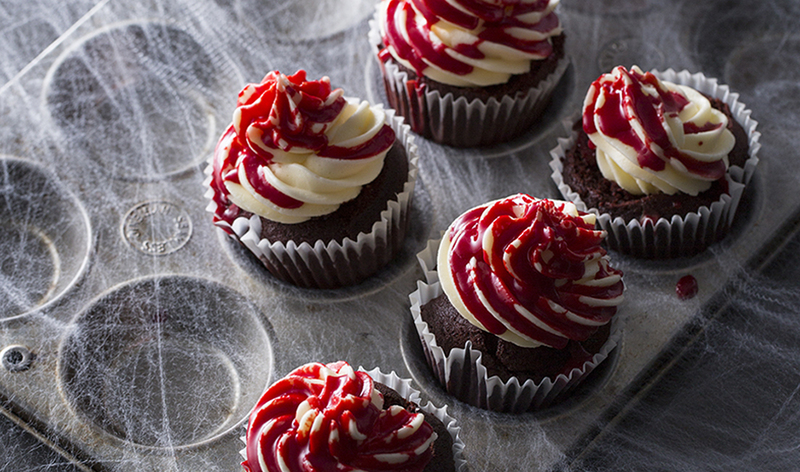 Drizzle this over the top of your cupcakes and enjoy!